Afaik these are the first screenshots. I think it'll just be a short film? 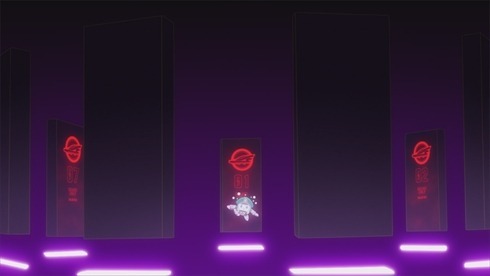 It looks like the 500 Type Eva made a special appearance in an episode of Shinkansen Henkei Robo Shinkalion The Animation. Kids are the conductors for trains that transform into giant robots through the use of special cards. Well, why not? It looks liek there is another eva-themed episode of this show. This time with Hikari and her sisters. More on that Hikari episode. I’ve never heard of this kid's anime nor do I really care to watch it. BUT with an upcoming episode basically being a tie-in with Evangelion I have to admit I’m curious to give the one episode a view. The Eva episode airs August 11th and is confirmed to have the voices of Megumi Ogata (Shinji), Kotono Mitsuishi (Misato) & Junko Iwao will be back as Hikari AND will voice her two sisters. There’s a possibility more of a cast will jump in for little walk on bits too. Seriously, I don’t care about the rest of this show but I will want to watch this episode and you nerds will have to help me get it! Looks like even Rei & Asuka will be in on the fun. If they get Yuko Miyamura to come back even for a line would this be her first TV performance in over a decade? Does it look kinda cheap & pandery as hell? Of course. Is a legitimate kids show taking place in the Evangelion universe a horrifiying prospect if you think about in any terms beyond merchanising? Absolute. (All these kids are gonna die...) But, since it’s only 20 minutes I’ll watch it. Pandery as it is. I'm a fuckn nerd,of course I'll watch it lol. Excited to hear their voices. Also, dear God, that Angel is a mix of (at least) Sachiel, Shamshel, Sahaquiel, Zeruel and Rebuild's Third Angel. cyharding wrote: It looks liek there is another eva-themed episode of this show. This time with Hikari and her sisters. Its WAY more than that, its an entire crossover episode with the Shinji and some of the Evangelion cast showing up as Shinkalion versions of themselves. The meta levels are so high, that it can't be contained. Not only did Megumi Ogata come in to voice Shinji, Kotono Mitsuishi even narrated the preview for the episode which airs this week!!! They posted the video on youtube for all to watch!!! I'm sorry. I think much of it has to do with the nature of the organization of the forums here. "Everything Else Evangelion" simply doesn't get as much traffic in its current form. We've discussed potential reorganization of the forums backstage and we have settled on a new arrangement which I think will be beneficial to everybody. However, we're now simply waiting on one of our tech savvy people to earn enough free time to implement it. Keep in mind that such reorganization would be tedious and very time consuming, so bear with us until then. S'all good. I love this place. Anywho, Animenewsnetwork has confirmed Megumi Hayashibara & more surprisingly Yuko Miyamura will voice Rei & Asuka in the crossover episode! It might only be a line or two each but that's still pretty cool. I don't know too much about Yuko Miyamura the person but isn't she pretty much retired from voice acting except for the Rebuild films themselves? Would this be her first non-theatrical role since the mid 00s? a e s t h e t i c angel from 2.0 is sad because it didn't get into the mix. Or it was too hipster about it. It seems Shinkalion was trending topic on twitter yesterday. That's the power the Eva cast has. No offense to the Shinkalion show, but I probably wouldn't have been interested otherwise (and that's OK since it's for children). Here’s all the Rei & Asuka from the episode I think. One line each. Of course Asuka’s starts off with the only acceptable option. “Anta Baka”. Last edited by Joseki on Sat Aug 11, 2018 3:57 pm, edited 1 time in total.